Interbike has come and gone and with it my last trip to Vegas. The show now moves to Anaheim, CA. Vegas is an interesting place to say the least. I'm glad I've seen it, Cirque de Soleil and Phantom, but I'm glad I do not have to spend more time here. A couple early morning runs down the strip alongside homeward bound revelers, gamblers and the leftover smells and discards of a night of partying has me wondering how people survive here. For an athlete, or those that like fresh air, dislike shopping and waste it is overwhelming to say the least. Some of the hotels and displays are definitely impressive, as are women's abilities to walk in 4 inch heels. With sufficient funds you can see some amazing shows with sets that won't be traveling to smaller towns like Kamloops, but you see it at the expense of witnessing the more depressing parts of our culture as people don't go to Vegas to use moderation. The show started with Dirt Demo in Boulder City where the Luna Chix took 22 female bike and clothing shop owners and reps for a mtb ride in the desert in their new Luna Sport outfits and camelbaks. It was crazy hot out and the trails are tough, but we had a great time. From Dirt Demo you move indoors for 3 days. 3 days of perfumed air (to cover the cigarette smoke), parties, dimly lit paths through casinos and full days at the expo definitely wear you down, but it was great to connect with my sponsors, check out their new products and visit with friends. It's also one of the few chances I get to hang with my Luna Ironman bud Terra who's belief that if she isn't helping someone through her involvement in sport than she's not doing her job, epitomizes the philosophy behind the Luna program. 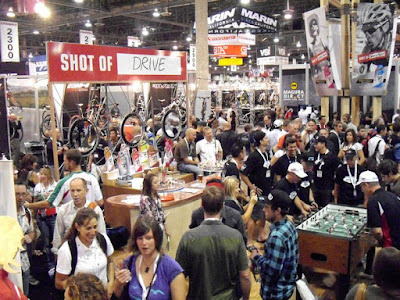 Interbike shows me how lucky I am to be with the Luna team and our group of fantastic sponsors. The Luna sport line is looking awesome, ClifBar and Luna have some great new products (Luna chocolate chunk, Clif Crunch white chocolate macadamia, Luna protein bars and the revamped Clif shot gel...when you can actually eat gels on a spoon you know they're good). Shimano, Avia, Mavic, Fox, Orbea, Maxxis, Vetta, Camelbak, Oakley thank you for a great season of support and innovation! Now it's back to reality, and cyclocross race organizing! Come race in the interior! I've never been to Vegas, but I'd probably pull my hair out living in all that neon and cement. Nelson, B.C interest me much more, but I've never been there either. I just prefer green trees and clean air, I suppose. Vegas has it's ups and downs. My parents live there in the winter. I have no idea how people survive in the face melting summer temperatures there. I can tell you that October and March are usually quite nice. And the riding is pretty decent. yeah i'm sure i get unfair perspective living only on "the strip" for a week. Boulder city does have some neat challenging rides. Nelson and the Kootney region are spectacular. Definitely worth a road trip. As for Blueberry Bliss I've yet to try it:-( Samples went so fast at the show.